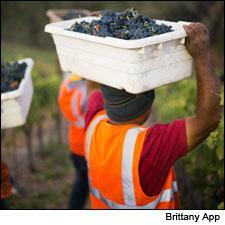 Vineyard workers bring in Grenache in California's Paso Robles. For the men and women who make wine, perhaps no word is more packed with nervous anticipation than "harvest." After months of spending time, sweat and money in their vineyards, it's time to see what nature delivered. For California, 2014 brought another year of record-breaking drought. For much of Western Europe, 2014 was unpredictable, with sun, clouds and plenty of hail in some unfortunate spots. In the first of five 2014 vintage reports, California winegrowers up and down the coast are breathing a deep sigh of relief. While the state still suffers from drought conditions, which lowered yields in many spots, well-timed rains kept vines growing and a sunny summer and fall meant ripe grapes. Growers do fear what 2015 will bring, however—if the drought continues, shrinking groundwater could mean a horrible new year. As for final quality in the bottle, it's too early to know, but here's a sneak peek. The good news: A long growing season with moderate weather lead to an early harvest, allowing growers to avoid damaging fall rains. The bad news: Continued drought conditions meant that the crop size was smaller than usual in many vineyards. Analysis: Mendocino County's Anderson Valley had little to complain about in 2014. Winter was exceptionally dry—part of California's long drought—and just as growers and winemakers were about to panic, the rain arrived in abundance in February. A warm spring laid the groundwork for early budbreak, and the growing season ran ahead of schedule all year. “Being an early vintage is always advantageous in Anderson Valley, where it’s almost certain to rain by Oct. 15,” said Goldeneye winemaker Michael Fay. Anderson Valley built its reputation on Pinot Noir, and vintners report that the 2014s show an agile balance between ripe fruit and lively acidity, thanks to abundant sun and cool evening temperatures. Harvest itself was unusually condensed, with grapes such as Gewürztraminer, Chardonnay and Pinot arriving at the winery at the same time. “It felt like everything was ripe all at once—because it was,” said Roederer Estate winemaker Arnaud Weyrich. The good news: 2014 was a dream vintage, with quality along the lines of 2012 and 2013. The bad news: Not much to complain about, though drought conditions and small crop size did prove to be minor irritants. Picking started: Everything was ready to go in early- to mid-August, even Cabernet Sauvignon, which usually ripens much later. Promising grapes: Cabernet took center stage, but all grapes—including Chardonnay, Merlot, Syrah and Zinfandel—and regions fared well, under ideal weather conditions. Analysis: Napa Valley's harvest was unusually early this year, not surprising given the state’s ongoing drought, which was so extreme that the cover crops in many vineyards never took hold. Substantial rain in late February and early March relieved most of the stress and set up the vines for a vigorous start. "Early" was the key word all season, from budbreak to veraison to harvest. Thankfully, the hotter months proved milder than most expected. A vineyard worker harvests Grenache Blanc at Epoch Wine Estates in Paso Robles. The drought contributed to the dramatic cuts in yields across the region. “Those growers that have access to ample water and were able to supplement the meager rainfall over the past few years saw normal crop loads of perfect fruit,” said vintner Terry Hoage. “Those growers that didn’t have access to enough water during the season saw quality fruit, but in diminished crops,” he added. Outside of drought talk, it was a relatively uneventful growing season, with a dry, mild winter and vines getting off to an early start in spring, a pattern that followed through flowering, set, veraison and harvest, where there weren’t any memorable heat spikes. Epoch’s Jordan Fiorentini said that even though the harvest was early, budbreak was even earlier, resulting in more grape hang time than in 2013. Most vintners reported a compressed, fast harvest. The Farm’s Santiago Achával explained, “We picked 15 tons in five days! That’s 95 percent of our harvest in less than a week." Drought conditions are bittersweet for Paso Robles vintners—low yields, small clusters and tiny berries should result in concentrated wines, but not much of them to sell. “The concentration of flavors is unreal,” said Nick Elliott of Nicora. "And the berries were so tiny that I often wondered if there would be any juice to press out after fermentation." Winemaker Jordan Fiorentini inspects grapes fresh off the vine. The bad news: A shorter growing season and compressed harvest left vintners scrambling. Continued drought conditions have made them concerned about next year. Drought concerns continue, with reservoirs and wells getting lower and salt content in the soil increasing, stressing the vines, forcing some vintners to irrigate before veraison. “This pre-veraison irrigation, we think, caused berries to swell and cluster size and crop levels to increase above expected levels,” said Brandon Sparks-Gillis of Dragonette. “As a result we dropped a significantly larger amount of fruit than we would have liked.” Some vintners who didn’t irrigate expressed the opposite: extremely low yields, down as much as 50 percent, particularly with Grenache. Some winemakers report moderate to low acidity levels in the wine that will be a distinctive feature of 2014. “It will make for really stable wines, really rich and hopefully richly textured," said Gavin Chanin of Chanin Wine Company. But the outlook on the wines is positive. “The wines should be fruitful and balanced, with a few bottlings leaning toward being big and powerful,” said Craig Jaffurs. Two sorting table workers look for any sub-par grapes at V. Sattui in Napa Valley. The good news: 2014 marks the third straight high-quality vintage thanks to near-perfect weather throughout the season. The bad news: Some saw lower yields than normal. An early harvest presented space problems for wineries that were trying to bottle last year's wines before the next vintage went into barrel. Challenging grapes: Syrah and Grenache. Rocky sites struggled with the drought conditions but still produced high quality, despite low yields. Analysis: Despite the drought, this growing season presented few challenges for Santa Cruz winemakers. High winds during the onset of the growing season lead to lower yields than the previous two vintages, as much as a 25 to 35 percent drop for some wineries. But the rest of the season was warm and even, and low yields lead to high quality across the board. Bradley Brown of Big Basin Vineyards reported good phenolic ripeness at low alcohol levels with great color. While Pinot Noir and Chardonnay seem primed for another solid year, Brown also sees promise in Rhône varieties from the region. Harvest started early for everyone. Ridge Vineyards started and finished early, with nearly all their vineyards picked by the end of September. Jeffrey Patterson of Mount Eden Vineyards said their picking kicked off Aug. 4, the earliest going back 70 years for the vineyard. But he believes that, much like previous dry years, this year’s quality appears great and will showcase the kind of elegance Mount Eden is known for. Freshly picked Cabernet Sauvignon heads into the winery at Justin. The good news: An easygoing growing season got off to an early start and was moderately warm all year. The bad news: Continued drought conditions stressed some vineyards, creating long-term concerns for vineyard health and production. Analysis: “Slow and steady wins the race seemed to be the mantra of the year,” said St. Francis winemaker Katie Rose Madigan. An early, long and modestly warm season in Sonoma County allowed most winemakers the luxury of picking at the optimum time. With many varieties ripening at the same time, Sullivan said tank space was at a premium. Carlisle winemaker Mike Officer said 2014 was the earliest and most-condensed harvest he had experienced. “Had it not rained a little in the latter half of September, our harvest would have been over before Oct. 1. Some years we don’t even get our first fruit until Oct. 1,” he said. Ripe Grenache is waiting to go at Tablas Creek Vineyard. My heart does bleed for Central Coast vintners. The 2014 vintage seems like a fulcrum/crucible in which we'll see at least 30 percent of them fold. It's not for lack of insight, skill, desire or ability, just for lack of water. Water politics in the region may yet destroy some of the most talented vintners of our generation. The timing might be right for an assessment of Paso Robles' new 11 AVAs relative to the California drought which just finished its third season. Climate variation was one of the reasons for the new AVAs...it would be interesting to see if the 11 are as distinct as submitted.